I spent Lent of 2012 in Israel. I was fortunate to be one of a few lay people included on a trip Bishop Mark Beckwith of the Diocese of Newark arranged for his clergy. It was to be one of the most powerful experiences of my life. When we arrived in the Garden of Gethsemane, our guide explained to us how olive trees are trimmed of their branches on a regular basis and in their place grow many more branches. He told us of how the roots grow new trunks which, as they grow, eventually merge with the tree causing it to grow ever larger. As he came to the end of his talk, he invited us to go into the Garden to pray just as Jesus had done all those years ago. 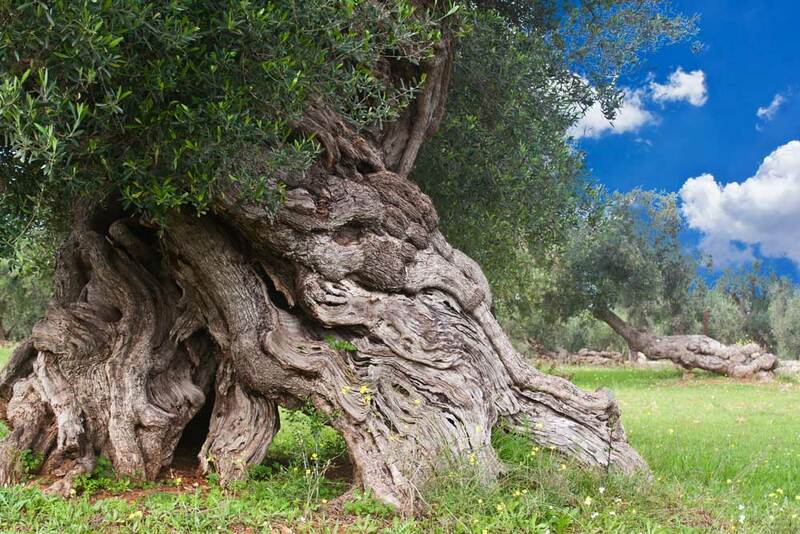 That is when I began to imagine Jesus at the roots of the same olive tree I stood before. He was a carpenter, he knew all about trees. He was a man who spoke in parables. And so it was, I came to believe he found some sense of peace as he prayed. He knew his life was about to be taken. But, he also knew olive trees. When you cut off their branch, new branches grow and the base gets ever larger. I imagined Him at peace knowing that while they would cut Him down, new followers would arise and band together and keep on living His message of hope and love. You and I are testaments to that vision today. Thanks be to God! And that is how my Lenten epiphany informed the vestments that would follow… the darkness cannot overcome the light, even in the most uncertain of times. The first picture shows the Lectern hanging and Frontal. Three fine stands of light appear in the darkness; one is the God thread, another the individual and the third all of human kind. The God thread holds and supports the individual until human kind joins in. As the strands get to the frontal, they grow in size with the light getting ever more powerful. 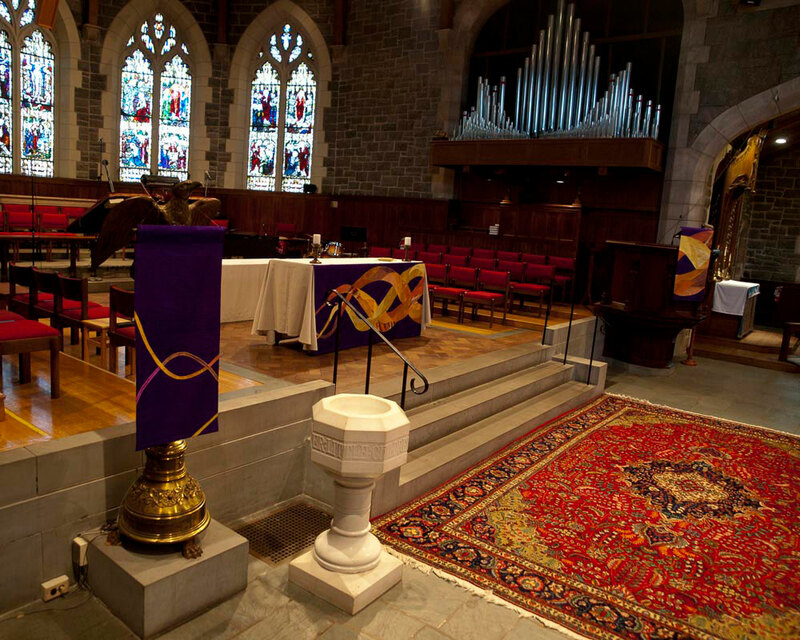 The second picture shows the Frontal with the Pulpit hanging now in view. The Pulpit is almost all light and you can imagine Easter just out of reach for the moment but promising to be there. If you look closely at the frontal, you will see the strand of light that has a hand painted silk within that includes browns and reds… that is the God thread; that is God saying “give me all your pain, your fears, your worries and I will hold them for you”. 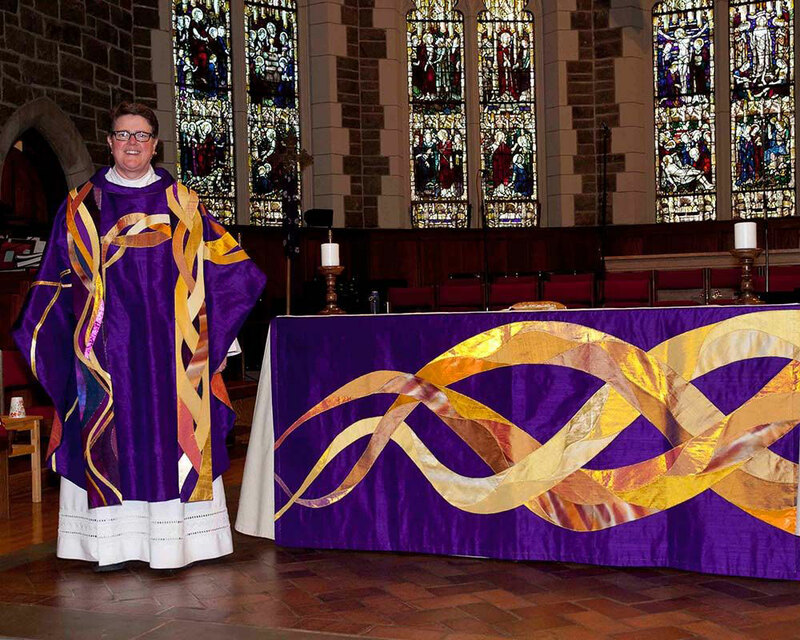 The metaphor is continued on the chasuble and stole. Be sure to notice how the light comes from the reverse side of the stole in the beginning and spills over to the reverse side as the light grows ever stronger. 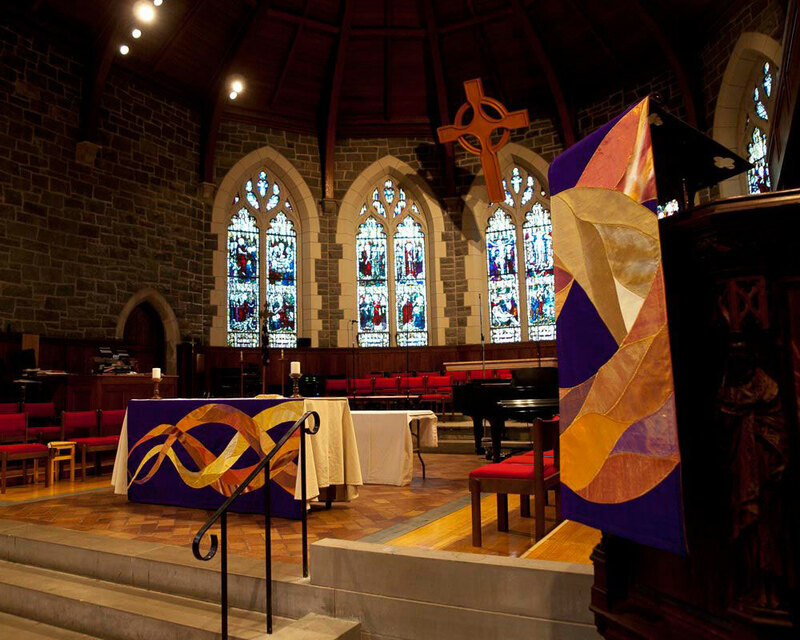 The column banners are purple as you look toward the altar and show an ever increasing number of light strands coming into the church. 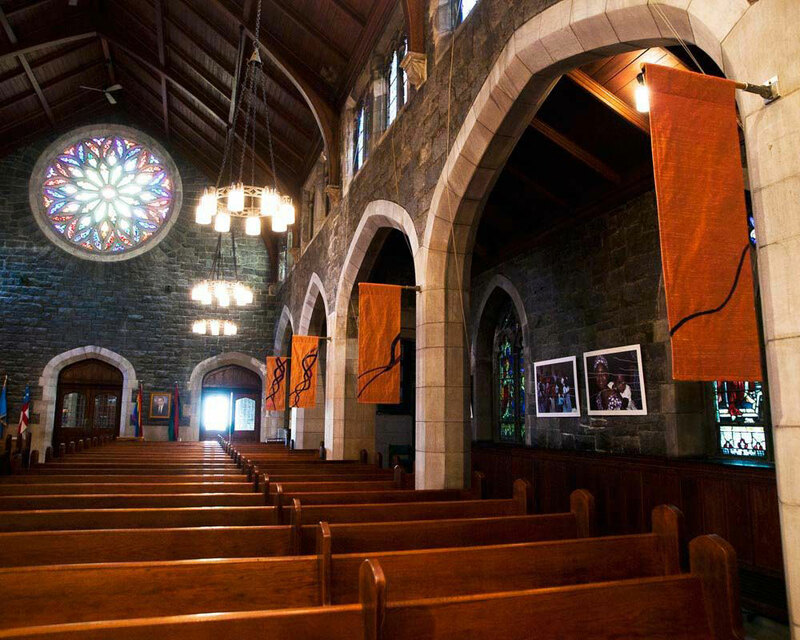 As you walk away from the altar, the banners are full of light and the strands have turned to darkness being blown away. It was such an interesting challenge to create the contemporary Celtic knot used in this design but I love the symbolism of how we are all connected, including the God thread!